The Gault Clay is known for its exceptional diversity of fossils. Deposited across northern Europe in the Lower Cretaceous, 100-112 million years ago, its abundance of ammonite fossils shows that it was laid down in a marine environment, at a time when sea levels were rising rapidly. Best seen at Folkestone in Kent, the Gault is sandwiched between the Lower Greensand and Chalk formations. The Folkestone Warren landslip has provided ample opportunities for fossil collectors for centuries. The land is still on the move today, but on 19 December 1915 a major slip shut down the local railway for five years. William Smith (1769–1839), who published the first geological map of England and Wales 200 years ago, called the Gault ‘blue marl’. He used the fossils found in it to map the Gault across the south of England. Along with ammonites, it is possible to find snails, clams, shark’s teeth, fish, crabs and lobsters. Even dinosaur fossils have been found, including the ankylosaur Anoplosaurus. Some of the Gault collections in the Museum date back to the 1800s; others were collected as recently as 2015. The wide geographical distribution of ammonites makes them ideal for mapping rocks. 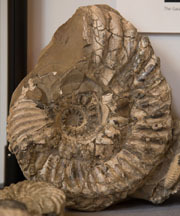 This ammonite is one of many on display in the presenting case. They are all the same species, and come from a specific zone within the Gault Clay, but all come from different places. 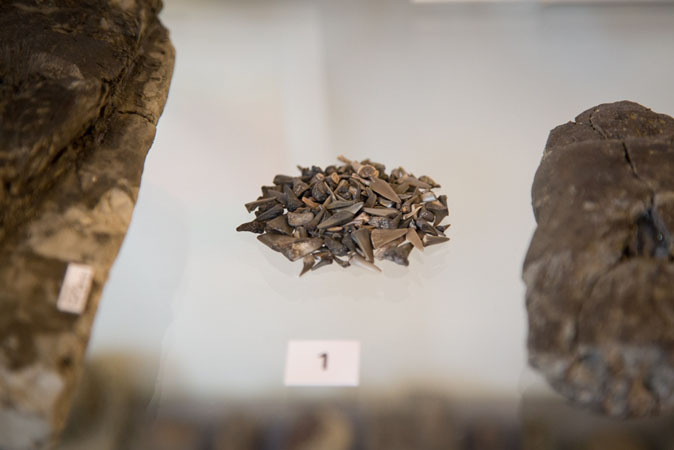 Teeth from a variety of shark species found in the Gault Clay.